A highly-rated teenager, who is valued at £90 million (R1.5 billion), has continued his rapid rise in world football after he set a unique goalscoring record in the Bundesliga over the weekend. Former Manchester City starlet Jadon Sancho became the youngest player in the history of the German top-flight to find the back of the net on eight occasions following his first-half strike in Borussia Dortmund's 3-3 stalemate with Hoffenheim. 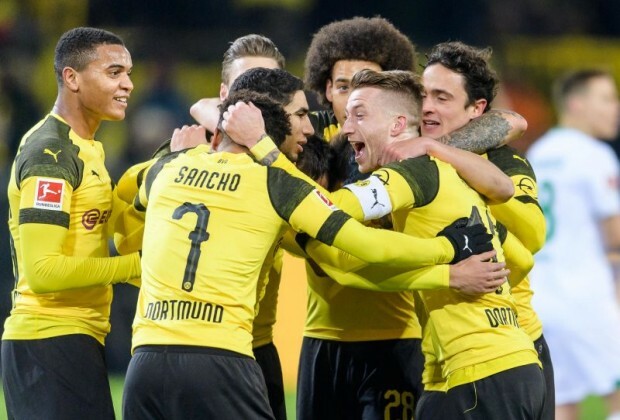 Sancho, who completed an £8 million (R141 million) move from City to Dortmund in August 2017, has become an integral part of his side's title bid this season, netting eight goals in the Bundesliga and one goal in the Champions League this season. In 2018/19, the England international has so far found the back of the net against the following teams: Nurnberg, Stuttgart, Schalke, Borussia Monchengladbach, Hoffenheim, while netting a brace against Hertha Berlin. In addition, he also scored against Bayer Leverkusen last season. Earlier in the campaign, the 18-year-old also opened his UEFA Champions League account against Atletico Madrid. Overall, Sancho has amassed a total of 40 appearances for BVB, scoring nine goals, while being on hand to register 17 assists since his arrival at the club in August 2017. How many goals are you backing Sancho to score this season? Let us know in the comments section below.